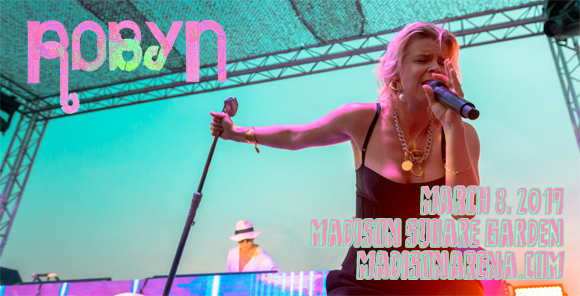 Swedish electro-pop pixie Robyn comes to Madison Square Garden on Friday 8th March 2019 for a night of floor-filling tunes like "With Every Heartbeat" and "Dancing On My Own"! The phenomenal performer will also be performing tracks from her eighth studio album, Honey, her first studio album in eight years! Tickets for the innovative performer are selling out super fast, so make sure you don't delay – get yours now to avoid disappointment! Swedish singer, songwriter and record producer Robyn signed with RCA Records in 1994 aged 15, and released her debut album, Robyn Is Here, the following year. In 1997, her dance-pop singles "Show Me Love" and "Do You Know (What It Takes)" reached the top 10 of the Billboard Hot 100, bringing her international fame. After success in Sweden with her second and third albums, My Truth (1999) and Don't Stop the Music (2002), Robyn's self-titled 2005 brought her further success with an international audience with the worldwide hit "With Every Heartbeat" and a Grammy Award nomination. Her 2010 Body Talk series, a trilogy of mini-albums, was critically acclaimed and received three Grammy Award nominations, as well as producing three top-10 singles: "Dancing On My Own", "Hang with Me" and "Indestructible". Robyn's eighth solo album, Honey, was released in 2018.